In the semi-finals of the Old Dominion Athletic Conference (ODAC) basketball tournament, junior Alicia Ygarza and her teammates had an extra special fan in the stands among friends and family. Her sister Bianca, a 2014 graduate and a former Royals teammate, was in the Salem (Va.) Civic Center to cheer them on – and support them through a frustrating loss. Having her family there helped Alicia recover from a tough loss after a standout season when the team posted a 15-1 conference record and a 23-5 overall record (After the loss, the Royals received an NCAA tournament bid, where they lost to undefeated Thomas More College in Crestview Hills, Kentucky, in the second round). “I cried. It was so heartbreaking,” said her mother, Joyce Ygarza, referring to the family’s emotions in their hotel room following the semi-final loss. Joyce and her husband, who live in Lancaster, Pennsylvania, have been loyal fans since the girls began playing at age 4. It was easier to get to games when the girls were playing at Penn Manor High School, than when they opted to attend a university more than three hours from home. The trips south to Harrisonburg meant many hotel rooms and late nights. And the rigorous schedule of basketball kept Bianca and Alicia away from home for the majority of the holidays. Coach Kevin Griffin, a 10-year veteran with the program, has played a large role in this, making coaching and mentoring the whole student-athlete a priority. Bianca Ygarza was EMU’s Women’s Athlete of the Year as a sophomore and senior. Bianca graduated from EMU with a degree in nursing. It is one of the most demanding majors EMU offers. Many late nights are spent with a head crammed in an anatomy textbook. And when nursing students have their clinicals (the nursing equivalent of an internship), they often awake and leave for the hospital before the sun rises. “There were times I cried because I thought I would fail out of nursing school,” Bianca recalls. She has one more hurdle to cross. Now back in Lancaster, she spends her time studying for the NCLEX, an exam that aspiring nurses must pass in order to receive their nursing license. While in school, Coach “Griff,” as he is called by his players, gave Bianca his support, giving advice when she confided troubling life situations, she says. Griffin says he likes his players to be exemplary role models, both on and off the court. “Two of the hardest working kids I have ever coached,” Griffin says of the Ygarza sisters. Alicia’s hard work shows off the court. A digital media major with a talent for singing, Alicia often finds herself after practice in the lab working on a project, or in a practice room in the basement of Lehman Auditorium with a cup of tea practicing her vocals. Alicia started singing around the age of 6, mostly in church. She performs in the gospel choir, and at chapels and banquets. 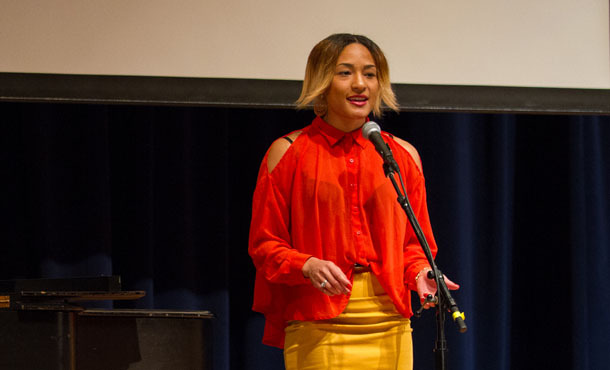 She recently gave two riveting performances at a campus event featuring Nobel Peace Prize winner Leymah Gbowee. Since her freshman year, she has developed increased confidence in her artistic expression, says her academic advisor, Jerry Holsopple, a professor in the Visual and Communication Arts Department. He says that, above all, he has seen Alicia’s maturity of thought develop. The digital media major, Holsopple says, is very public – students’ productions often find themselves under critique, which means students’ progress is often witnessed, and supported, by the campus community. On the court, Alicia is not afraid to make suggestions to the coaches during time-outs. She plays the point, a role that does not always make for a glamorous stat-line. She directs the offense, sees the court, and gets players involved in the game. Bianca, during her time at EMU, was a versatile post player. She earned first-team all-ODAC honors as a sophomore, junior, and senior, and she was the EMU Women’s Athlete of the Year in her sophomore and senior years. She joined EMU’s 1,000 point club as a senior, finishing her career with 1,215 points. This placed her sixth in the program’s history. The two sisters grew up playing basketball together, but they are more than teammates. During the two years that they overlapped at EMU, Bianca says that they would hang out nearly every day. They aren’t just sisters, they’re best friends.